The SciTS 2019 Program Committee welcomes your abstract submissions for workshops, oral papers, panel presentations, and research posters. Please note the earlier submission deadline! The submission period is from September 15, 2018 to the January 15, 2019. All abstract submissions should use the Abstract Template format and be submitted as a PDF via our Abstract Submission Form. • Abstracts due: January 15, 2019 at 11:59pm EST (Eastern Standard Time). • Presenting authors are responsible for registration, travel, and hotel costs. • Any presenter who is unable to attend should arrange for another qualified individual to present the paper/poster in question. If such a change is necessary, please notify our conference team. Workshops provide presenters the opportunity to present original work related to conference topics. The SciTS Program Committee invites submissions from individuals or groups to conduct Special Interest Workshops and Seminars. Workshops/Sessions will be 3 hours in length. All topics relevant to the application of Science of Team Science approaches are welcomed, specifically with respect to training sessions that will equip SciTS investigators with tools and technical skills for data collection, analysis, or presentation in their research areas. Workshop/seminar proposals that incorporate a variety of instructional approaches (e.g. lecture, interactive discussion, hands-on exercises) and materials (e.g. slides, handouts, sample data) are strongly encouraged. We encourage workshops or seminars with a focus on methodologies including systems approaches to the field of SciTS as well as methodologies for conducting evaluation and understanding team dynamics. 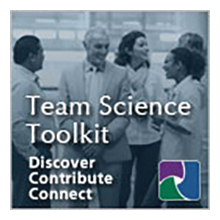 Furthermore, we welcome workshops and seminars that provide practical guidance for conducting and managing team science in a variety of contexts and settings, and workshops with a focus on developing team science educational and training resources.